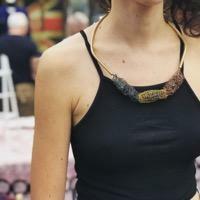 Courtney Hyland designs and makes narrative jewellery, influenced and developed by personal events/memories. Her latest project explores the memories she has of her grandparents, whom both suffered from Alzheimers. She wanted to explore memories and a way of making them wearable, therefore they would then become a physical object and not something a disease can take away from you. 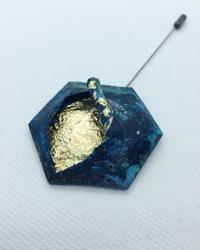 Memories are precious and she wanted to convey this within her work, therefore she has used diamonds, gold plating and gold leaf within her collection. This gives the work a physically precious appearance, and conveys the message that the memories are precious. The shapes and materials Courtney has used throughout her collection were influenced by her Grandparents; her Nan a keen knitter and her Grandad a coal miner, means she has explored coal, knitting, and the tools used. 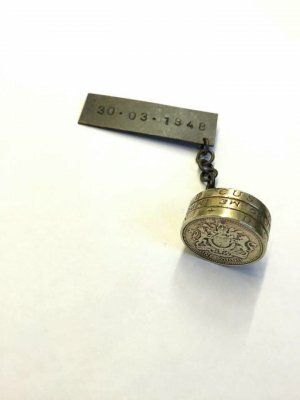 This exploration has developed into a collection of wearables consisting of brooches, rings and a neckpiece, the choice of how the wearables are worn was influenced by the passing on of a ring, brooch and necklace by Courtney’s Nan. -2017 (14th January- 12th March) - ACJ 20:20 Visions, 'The national centre for Craft and Design'. -2017 (20th March- 24th April) - ACJ 20:20 Visions, 'Sheffield Institute of Arts'. -2017 (18th May- 30th June) - ACJ 20:20 Visions, 'the Goldsmiths' Centre'. -2017 (11th September- 23rd October) - ACJ 20:20 Visions, 'Vittoria Street Gallery, School of Jewellery BCU'. -2017 (31st October- 9th December) - ACJ 20:20 Visions, 'The Crafts Study Centre, UCA Farnham'. -2018 (14-17th March) - International Amber Trip Jewellery Show 2018, Art jewellery contest, Lithuania, Vilnius. -2018 (21st-24th March) - Amberif jewellery Show 2018, Poland, Gdansk. -2018 (28th March - 17th April) - Vilnius Academy of Arts author jewellery gallery "Argentum", Lithuania, Vilnius. -2018 (10th September - 1st October) - "Ramybes" gallery, Lithuania, Palanga. -2018 (10th October - 7th November) - Vilnius Academy of Arts, Telsiai gallery, Lithuania. 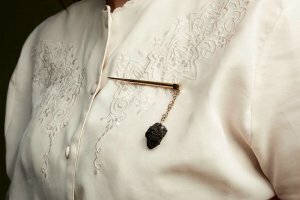 Brass knitting needle brooch with coal element. Patinated and gold leaf brooch. Knitted wire and coal necklace.